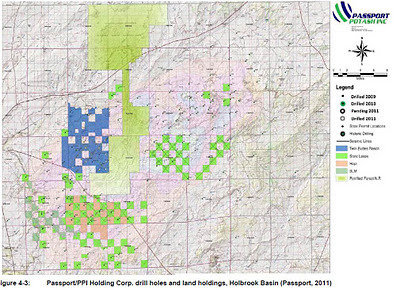 The NI-43-101 Technical Report on Exploration Potential on Passport Potash's potash holdings in the Holbrook basin is available for viewing or download at the SEDAR.com site. You need to identify the company name, and select "Junior Natural Resources - Mining" from the Industry Group category, and "Technical Report NI-43-101" in Document Type. The report was prepared by SRK Consultants in Tucson. Thanks to Steve D. for forwarding the link to the report.